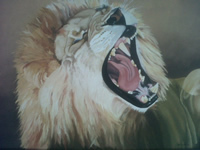 These two beautifully detailed paintings are done by Erica Yeo, Africa's Big Five- Lion and Buffalo. They are both oil paintings and the buffalo's horns have, by hand, been sculptured. Selling both for R20000 each.